When thinking up an idea for some creative place cards for the Thanksgiving table, I wanted to create something that not only looked great, but was also practical. So for Thanksgiving dinner, I’ve come up with place cards that not only hold the seats for your guests, but also serve as pie containers so guests can each take a slice of leftover pie home with them. I find that I often am too full for dessert right after Thanksgiving dinner, so the idea of dessert on-the-go at Thanksgiving makes total sense to me. And I’m sure I’m not the only one out there who has a hard time saving room for dessert on Thanksgiving! 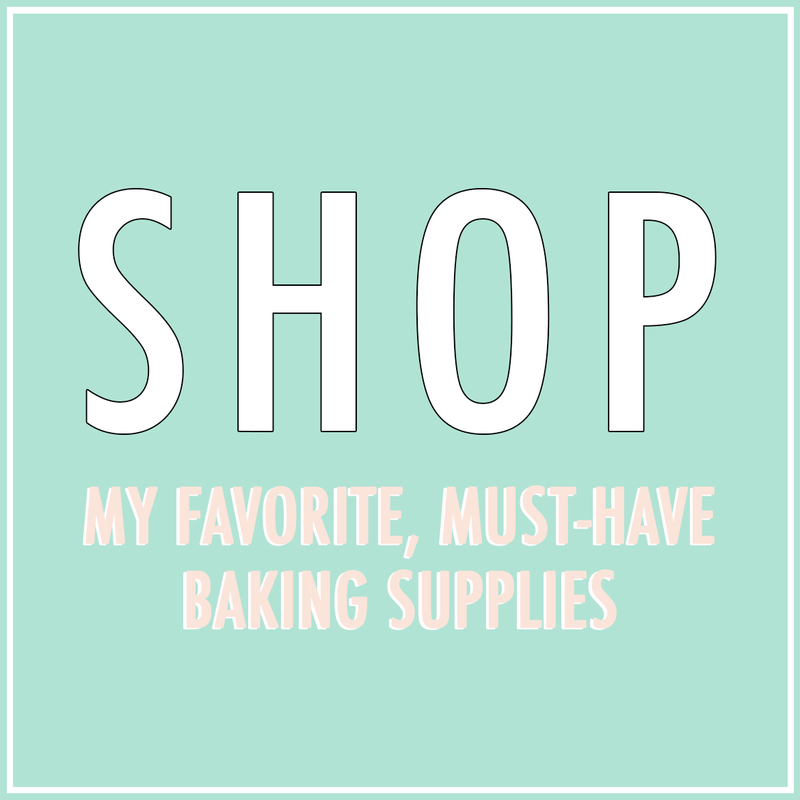 I’ve included basic instructions below, as well as a printable pie container template. Enjoy! 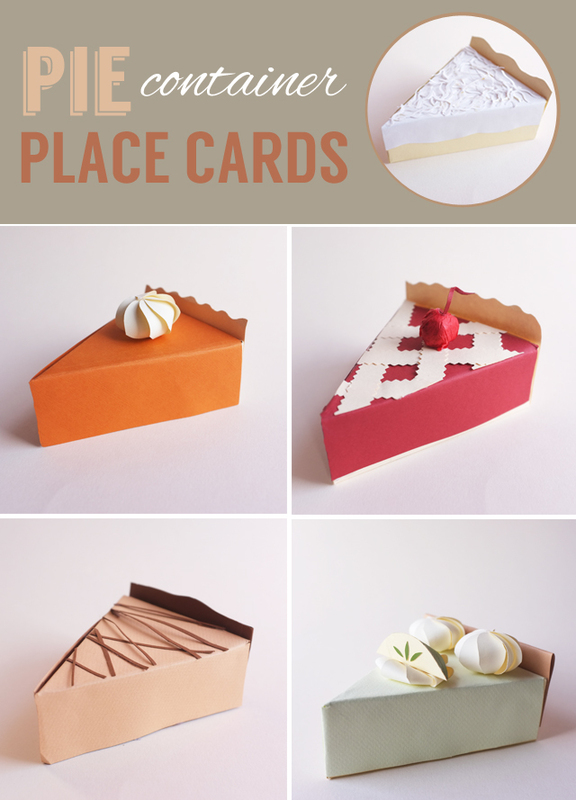 Step #1: First, download the pie container template and print the template out onto a semi-thick neutral colored card stock. You want the paper just thin enough to be able to crease, while still being sturdy. For each place card, print out a template, cut along the solid lines, and fold/score the dotted lines. 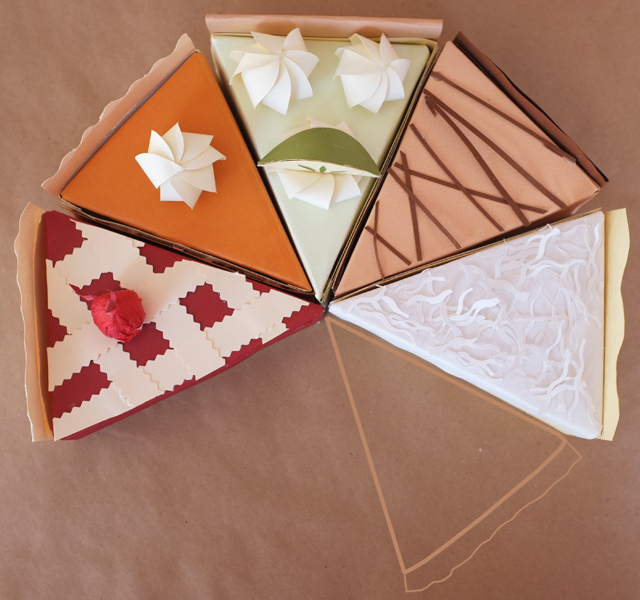 Step #3: Once your pie box is glued and ready for use, decorate it to look like a slice pie. As you can see I made a variety of pies for reference, including a coconut cream pie, cherry pie, pumpkin pie, chocolate cheesecake, and a key lime pie. 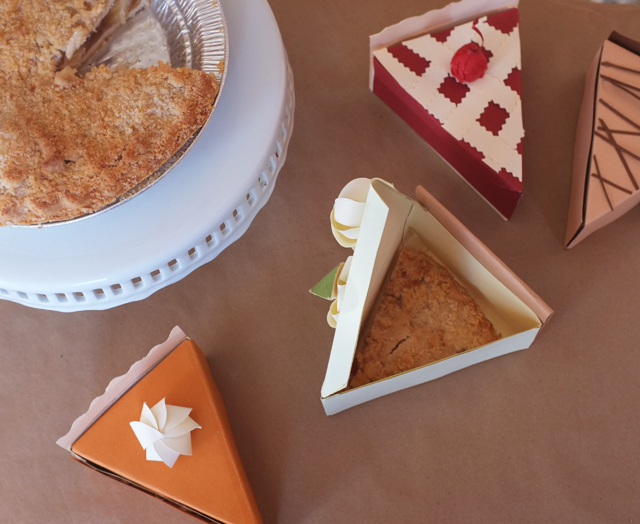 In keeping with traditional Thanksgiving meal, you may prefer to only make the pumpkin pie boxes, but that’s all up to you! 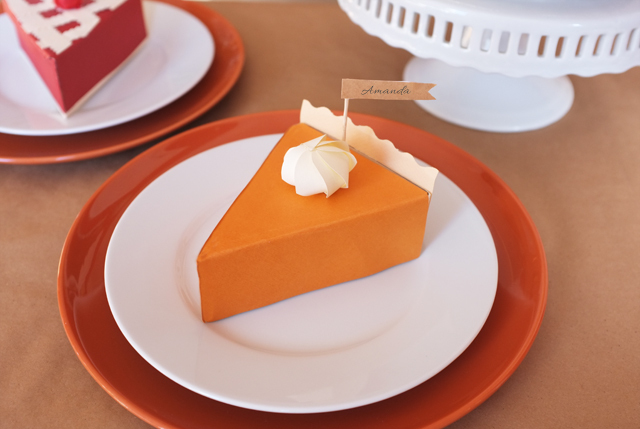 Since you’ve already traced the top and side of your pies onto your colored paper, cut and glue those pieces on. For your crust, make sure the paper width is equal to the back of your pie box, and then glue that on. Other tips: For the whipped cream topping, cut out a starburst pattern and glue the ends of each piece inwards towards the center. 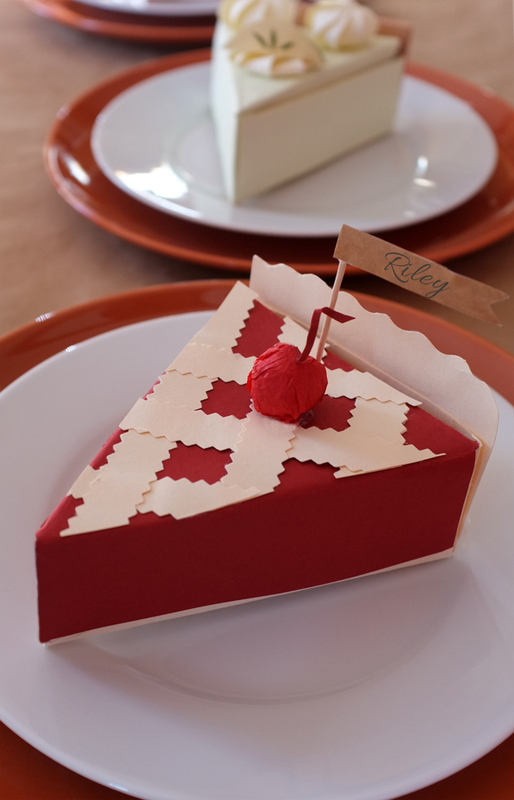 To achieve the lattice pie crust look on the cherry pie, use decorative scissors. Step #4: For the personalized flag topper, glue a strip of paper onto a toothpick and write your guest’s name. 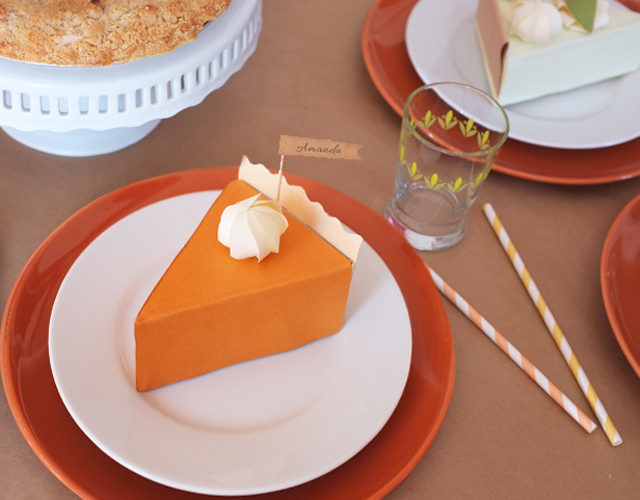 Poke the top of the toothpick into the top of the pie, and now your pie containers are all set for the table! Before dishing out the leftover pie to guests, make sure to line each container with a piece of wax paper. Your are a genius. So impressed. Alana, These are so charming!